SDCC 2016: Captain Marvel Announced! 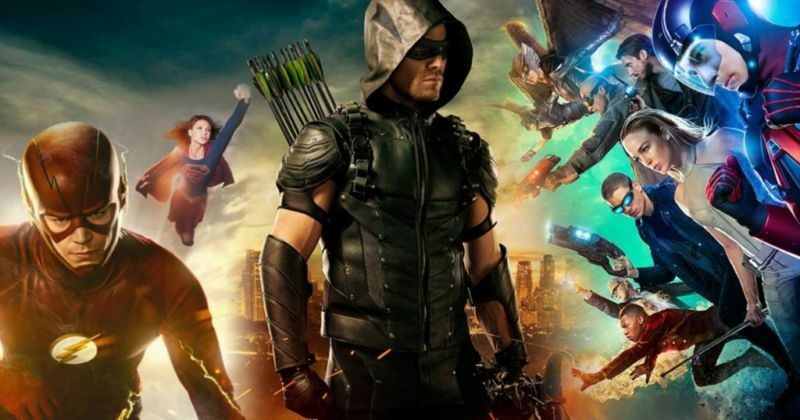 The CW channel has been busy, renewing its star superhero shows and collecting new ones under it’s wing; The Arrow enters it’s fifth season, continuing the adventures of Oliver Queen and his quest to clean up Star City. The Flash enters uncharted yet familiar territory to DC fans, DC’s Legends of Tomorrow sets it’s sights on the entire timestream and we have a new, but familiar face coming to The CW in the form of Supergirl, whose second season will switch stations to become part The CW superfamily. Unfortunately, this seems to be the closest to a Supergirl Season 2 trailer we will be getting right now, but considering the character is a little bit familiar with the big-names of the CW-verse thanks to a dimension hopping Barry Allen, I wouldn’t be surprised if we got to see a little more crossing of dimensions as the series progresses. First up, we have Season 5 of Arrow. The trailer begins with a brief summation of the finale of Season 4, which saw Oliver kill Damien Darke to fulfil his promise to the deceased Laurel Lance. The team disbanded in the finale, and Oliver begins his run as Mayor of Star City. Whilst you can imagine that this will interfere with his vigilante schedule, it look like Oliver will be continuing his crusade…both by reaching out to his old friends, and by educating new vigilantes inspired by the Arrow – the new Black Canary, Wild Dog and…Curtis Holt? It looks like Mr Holt will be taking the steps to becoming the CWverse’s Mr. Terrific. Additionally, whilst it is hinted towards the end of trailer that the antagonist for season 5 will be an archer, it has been confirmed that the new villain will be Prometheus. Long-time fans of the Emerald Archer in the comics will know the character well, as he is responsible for disarming Arsenal – quite literally – and for provoking Oliver into executing him. Does this mean we will see return of Roy Harper? Or does this mean something terrible for one of Oliver’s new apprentices? It has been established that this will not be the same Prometheus, but this still does not bode well for the vigilantes of Star City. We also get some insight into the flashback arc, which shows Oliver leaving the Island and heading to Russia. Which means only one thing: Bratva. The show established back in Season 1 that Oliver had become captain in the Russian mob during his five year disappearance…and it looks like we will finally see how. Back in the Season 2 finale of The Flash, Barry Allen did the unthinkable – heading back in time to prevent the murder of his own mother, creating an unthinkable paradox as the reason for him becoming The Flash disappeared from existence. Readers of the comics will be familiar with the move, as it sparked the event ‘Flashpoint’, which is what caused the reboot of the entire DC Universe (or was partially, if you’ve read DC Rebirth #1). The act of selfishness caused a ripple in time which drastically changed many characters origins and attitudes, including a missing Superman, an older Batman, a war between the Atlantians and the Amazons, and no Flash. Everything Barry Allen knew is gone…and yet he has all he ever wanted. The trailer gives us a glimpse at Barry’s perfect life – his mother is alive, his father was never jailed, and they all live together in happiness. But things are different – no one in the West family has the deep connection to Barry that they previously had, Cisco is now the head of Ramon Industries who is indifferent to his previous colleagues, and Thawne is Barry Allen’s prisoner who seems to have some idea of what has happened to the timestream. Throughout the trailer, we get glimpses of future events. Another unnamed speedster, garbed in black, who appears twice – once by himself, and again when he is confronted by…Wally West, who finally showing some speed and a new costume. Additionally, we get a glimpses of Doctor Alchemy, who appears to be another prominent villain for the upcoming season. The trailer also features collections of clips from the previous seasons, as if to emphasise the events which have been seemingly been wiped out by the actions of Barry Allen. However, as Thawne taunts Barry from inside a cell, it appears this villainous speedster may know that there’s more to this universe than meets the eye. A lot is left unanswered by this trailer, like the identity of the new speedster, the fate of the Rogues and how Barry will presumably get his speed now that the original event which created The Flash no longer exists. Finally, we have the Season 2 of DC’s Legends of Tomorrow, which picks up right where the series left off with the team being confronted by Rex Tyler, also known as Hourman and prominent member of the “Justice Society of America”. It has been revealed that the members of this incarnation of the team will be Hourman (Patrick J. Adams), Vixen (played by Maisie Richardson-Sellers, who will be a 1940s iteration of the superhero), Citizen Steel (Nick Zano), Obsidian, Stargirl, and Dr. Mid-Nite, with the three latter characters still being cast. The trailer itself reveals not a lot of new information as it is still in production, so it essentially sums up the events of the first season and the aftermath of the actions – the Time Masters are gone, and now history is unguarded against time criminals and those who would seek to manipulate events. Such as, New York being blown up…in World War 2. Which prompts the team to investigate, causing a confrontation with Arrow season 3 villain Damien Darke. Despite not being mentioned in the trailer, the antagonists have been announced for the upcoming season. A collection of villains to match the powers of these Legends and Justice Society – The Legion of Doom. This Legion will be comprised of familiar faces from across the CWverse, including Eobard Thawne, Damien Darke, Malcolm Merlyn…and Leonard Snart, freshly plucked from the timestream before he joined (and died for) the Legends. With all shows coming to Netflix, with a deal to air the up-to-date seasons once the finales have aired, Geek Pride cannot wait to see what lies in store for their favourite supershows. Which one are you most interested in watching?